Two weeks ago I spoke of the need for the church to find our voice during this election year. We need to participate in the public dialogue and contribute our perspective in the effort to define and enrich our life together. A nation of people looking for reason to hope today needs us to account for the hope that is in us (1 Pet. 3:15). When we sense that we are losing our vitality as the church, when we lose our voice in the public square (as we seem to have done) and our influence in the world around us weakens, the first and most important thing we need to do, I believe, is ask ourselves the hard question: Are we faithful as a witnessing and serving community? We don’t need to look first at how we balance our budget, or maintain our building, or gain new members. We need to look first at how we are serving in the world as witnesses to the gospel. “You are witnesses of these things,” the risen Christ says to the church. We have “a story to tell to the nations, that shall turn their hearts to the right,” as a great hymn says, “a Savior to show to the nations, . . . that all of the world’s great peoples might come to the truth of God.”3 So today we have two questions before us: Of what are we witnesses, and how are we witnesses? The first question is relatively easy to answer. The gospel of which we are witnesses is just what Jesus said it is, that our waiting is over, and the reign of God has dawned upon us (Mark 1:15). All of our visions for God’s creation restored, all of our waiting for the fulfillment of God’s promises, all of our hopes for the perfection of life, are complete in Christ. “Whenever anyone is in Christ,” Paul wrote, “there is a new creation: everything old has passed away [and] everything has become new” (2 Cor. 5:17)! Our hope for meaning and purpose in life; our hope for peace and contentment; our hope that we will make a difference for good in this world; our hope that our children and neighbors will enjoy these same things; our hope for a world where people live in such harmony with each other that we will beat our swords into plowshares and our spears into pruning hooks and refuse to resort to war any more (Isa. 2:4) – the good news we have to proclaim to the world is that the long wait is over and all of these things are in our hands, if we will only receive them. And that brings me to the more difficult second question: How are we witnesses of these things? The word for “witnesses” used here is the Greek word from which we get our English word “martyr.” You are martyrs for these things, Jesus said to the church. Are you living every day for things of ultimate value that are worth dying for? Are you actively laying aside the life you’ve been living, the life of the world, the life that has defined you as an individual, so you can live the life God promises and is already giving you? 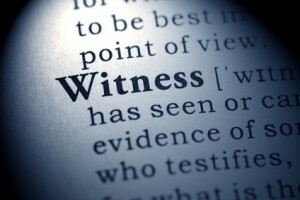 There are many ways to be a witness. Some are as extreme as Thomas’s readiness to go with Jesus to his physical death (John 11:7-16); others as simple as publicly accounting for your hope with gentleness and reverence (1 Pet. 3:15) or giving a cup of cold water to someone who is thirsty (Matt. 10:42). Maybe it’s to march in a picket line in a call for justice, or step over a social boundary and invite the homeless poor into your house, or to donate some of your good clothing to people who have too little (Isa. 58:6-9). Maybe your witness is to visit with love some residents at Beechwood or prepare a meal for our neighbors at the Seneca Street church. Maybe the simplest thing of all, and the most complex and life-changing, is to live every day, every moment, as if the good news is true, as if all you hope for is already yours, to be enjoyed and shared with others in God’s grace. Lay aside the life of the world. Take up the life of the gospel. Receive the gift of life God offers, and embrace it with all you are and all you have. Be the message the world needs to hear. Be the witness that your profession of Christ says you are. Notes — 1. The Book of Discipline of the United Methodist Church 2012, ¶124. ▪ 2. Ibid., ¶130. ▪ 3. H. Ernest Nichol, “We’ve a Story to Tell to the Nations,” The United Methodist Hymnal (1989), 569.